Whisk together the water, vinegar and salt until the salt is dissolved. (If you simmer the mixture as you whisk, the salt may dissolve more quickly but this isn't necessary) Allow to cool to room temperature. 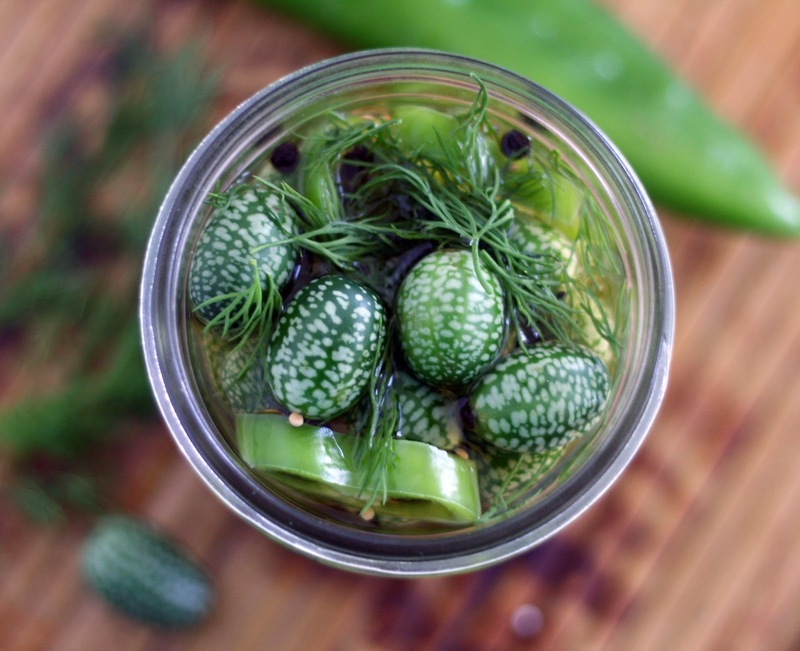 Evenly divide all of the dill, spices, gherkins and peppers between 2 pint jars. I had read about Mexican Sour Gherkins, also known as sandita, several times before but I could never find them. Then my friend Olga told me about her produce delivery boxes that she loved. She is based near DC and tweeted them how jealous I was that they didn't deliver to Baltimore. Well, they tweeted back and it turns out they do! I signed up for a box and noticed that you could add items on to you delivery beyond what comes in the box. Imagine my delight when I found they had Mexican Gherkins! I, of course, ordered a pound. They look like little baby watermelons (mine were about 1/2-3/4 inch long) but taste similarly a tart cucumber and have a cucumber-like interior. They are a bit crunchy so I thought they'd be perfect as bite-sized pickles. I made them into refrigerator pickles (although they are safe to water bath can) to make sure they kept that crunch. They are perfect as it, on a salad and I'd bet as a cocktail (or mocktail!) garnish. Want to know more about this vegetable? Check out this article in Modern Farmer.